I was recently given the opportunity to create a custom tee from WhoopTee for review! WhoopTee wanted to create a custom t-shirt design and ordering process that would be fast, easy, inexpensive, and fun. They are run of give principals: Customer Service, Quality, Shipping and Delivery Times, On-line Design Tools, and Competitive Pricing. Plus free shipping with every regular order. How could you go wrong? I got to design my shirt myself and It is way cool. I love creating custom shirts and with WhoopTee I got to choose a graphic to add to my shirt, one of theirs or one of mine (i uploaded my own), I also added text and got to pick from their great selection of font styles! 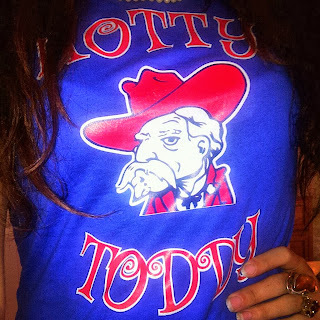 With it being football season and all I went with an Ole Miss, my favorite college team, design and I can NOT stress to you guys how much I LOVE this shirt!!!!!! I love my shirt design. The printing is fantastic, the colors matched up perfectly, my uploaded graphic looks amazing, the fit and quality of this shirt is awesome, I mean it’s PERFECT I give it 5 stars! Overall if you are looking for a great website to customize clothing, from 1 piece to orders of 100s+ WhoopTee is the place to go! The website and designing is easy to use, I even got to save my design which is great because my mom wants to order the same shirt so I wont have to go back and recreate the design it’s already saved, and best of all the finished product couldn’t be better! My WhoopTee Shirt is currently my favorite piece of clothing!!! WhoopTee would be awesome to use if you have an event and need custom t-shirts for it. It also would be great for a gift. Being able to completely design your own custom t shirts is something that I love doing and I'm excited to do again soon! WhoopTee made it easy and fun! The way you designed your blog is simply awesome. Now a day this is the fashion to designed T-shirts in various ways and it also gives a unique look. At Freedom Clothing Co provide wide varieties Mens Clothing Online.